Do Anglican Dioceses in Britain have banners of arms or some other armorial flag to go with their (mostly quite stylish) coats of arms?? From what I understand, for Anglican dioceses there exists a pattern, namely the flag is white with a St George cross, and in the canton / upper hoist corner the coat of arms of the diocese. This means possibly just the small coat of arms, i.e. the shield. See the Diocese of Chichester site for an example. In the main, that is right. However, at Diocesan Church House in North Hinksey, Oxford, they fly a St. George's Cross flag defaced in the upper hoist with the logo of the Diocese and not the shield from its arms. This flag is not flown every day, rather on holy days and so on. As far as I recall, the one used on the flag is black, rather than blue. Their coat of arms can be viewed at http://www.oxford.anglican.org/detail.php?id=1242 at the bottom of the page, with a blazon. The correct usage is for Anglican churches to fly the St George's Cross with the arms of their diocese in the canton. Many Anglican churches - perhaps depending on the diocese - fly an undefaced St George's Cross. (Here in Bristol diocese, and in the neighbouring diocese of Bath and Wells, I have only seen undefaced St. George's Crosses until a year or so ago, when St. Mary Redcliffe - the grandest parish church in Bristol - started flying a correctly defaced St George's Cross. As far as I know, Anglican dioceses don't have banners of arms, but, this being unregulated England, there may be exceptions. As the Diocese of Chichester site says, individual bishops may have arms and may use banners of arms but these would not be the banner of the diocese. It is also debateable whether the defaced St George's Crosses which should be flown (and sometimes are flown) on individual churches could be called the flag of the diocese in a way analogous to a sub-territorial flag (though the Diocese of Chichester site does use this term). I would be surprised if, for instance, such a flag was flown at the relevant Bishop's palace. I would see them rather as locally differenced flags of the Church of England as a whole. I have spoken to the College of Heralds regarding the question of banners of the diocesan arms, and they say that the arms would have been granted to the dean and chapter (of the cathedral), however, there is nothing in the law of arms which prevents the present bishop from flying a banner of those arms from his palace, or indeed, impaling them with his own personal arms and flying the resulting banner should he so wish. As a matter of courtesy (if not of policy) I would imagine that a bishop would run it past the dean and chapter first, but I cannot imagine any circumstances (or grounds) for them to refuse permission or even object (except those of expense)? I find the College's answer puzzling. The arms of a cathedral itself would be granted to the dean and chapter, but I believe the arms of each diocese were granted (actually confirmed in the case of most old dioceses) to the bishop of the time and to his successors in office. Bishops of the Church of England are corporations sole and, unless I'm mistaken, it is in the capacity of a corporation sole that the bishop applies for and is granted arms. That should mean that the incumbent bishop "owns" the arms of the diocese and could fly a banner of them in his own right. The dean and chapter could fly a banner of the cathedral's own arms, but not those of the diocese (unless, of course, the bishop was actually present at the cathedral). That, at least, is the logic of how I have understood English ecclesiastical heraldry. As I say, that's why the College's answer is surprising. 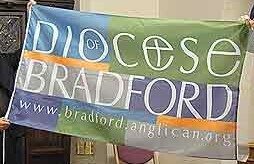 The Diocese of Bradford introduced a specific exception on 19 June 2004, as follows: www.bradford.anglican.org (scroll down to "John and Malcolm "raised the flag""). The image of the flag can be found here. Earlier on the page, it is said: "And we were assured that, though the Earl Marshall said in 1938 that the flag of St George is the one to fly on churches, this was never made compulsory." The arms of the Province of Canterbury are "Azure an archiepiscopal staff Argent ensigned with a cross formy Or surmounted of a pallium Argent edged and fringed Gold, charged with four crosses formy fitchy Sable". The archbishops of Canterbury fly a banner of arms of their diocese, as shown in the World Flags Database. The Anglican Diocese of Dunedin, New Zealand just flies the St. George's cross unadorned, as far as I'm aware. I don't even know if it has official arms - even its website simply uses a logo of a stylised cross (http://www.dn.anglican.org.nz/about_us/about_us.shtml). At Diocesan Church House in North Hinksey, Oxford, they fly a St. George's Cross flag defaced in the upper hoist with the logo of the Diocese and not the shield from its arms. This flag is not flown every day, rather on holy days and so on. As far as I recall, the one used on the flag is black, rather than blue. Their coat of arms can be viewed at http://www.oxford.anglican.org/detail.php?id=1242 at the bottom of the page, with a blazon. Oxford is a unique case, in that Christ Church Cathedral is the only church in the Church of England or the world, as the college web site states - which is both a cathedral and a college chapel. The Dean of Christ Church is simultaneously the head of Christ Church College, one of the largest in the University of Oxford and the Dean of the Cathedral. There is a coat of arms for the Cathedral: http://www.chch.ox.ac.uk/modules/standard/viewpage.asp?id=479 and a separate arms for the Diocese of Oxford http://www.oxford.anglican.org/images/logos/arms.jpg, but note that it is stated on the Diocese's web site that this is "not official". There is no provision for flying a flag in the Cathedral buildings themselves, rather there is a flagpole at the front of the college, facing on to St Aldates Street, where there is ordinarily flown a banner of the college arms, which can be seen on the college's home page here: http://www.chch.ox.ac.uk but only on certain days connected with the college or the university, such as when a graduation ceremony is held. The flag to be flown in the diocese of Rochester is the flag of St George with, in the canton, a shield of the arms: Argent on a saltire gules an escallop or. The diocese of York flies a banner of arms, shown at World Flags Database. There is a chart which purports to show all the diocesan arms at http://whitelionsociety.org.uk/WLS_Dioces_of_England_arms.jpg. However, I count only 43 arms on it, and according to several sites, including Wikipedia and the Church of England website there are 44 dioceses [not counting the diocese of Europe]. The actual chart is available from the White Lion Society, an organization formed to support the College of Arms.